It will have been difficult to miss in the news over the past 48 hours that the Prime Minister, Theresa May, has called a snap General Election for June 8th 2017. With all the uncertainty in the post-referendum era and with lots of burning issues at hand, it will certainly be an interesting event. Of course, General Elections and local council elections mean one thing - the public going to the ballot boxes to cast their vote. Public building are usually used for polling stations, with larger arenas and other venues used for regional counting stations. 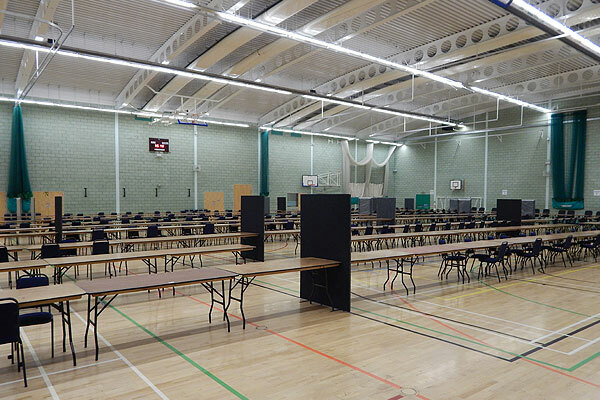 Across the years, Event Hire UK has been one of the foremost suppliers for election furniture hire, as councils, as this will this time round, will need to hire large quantities of trestle tables, chairs, dividing screens for privacy and other furniture hire for polling booths and vote counting venues. The fact that Event Hire UK has four distribution hubs around the country means that we are perfectly placed to be able to provide furniture hire in the quantities required for many different councils and their venues. We are, in some instances, also able to offer a supply and set-up service the day before, providing you with the manpower to set up your venue according to a pre-arranged plan. Whether you need to hire trestle tables, folding chairs, office screens or other items from our furniture hire range for the upcoming General Election, get in contact via email or call our freephone number where one of our expert sales team will be delighted to talk through the various options with you.